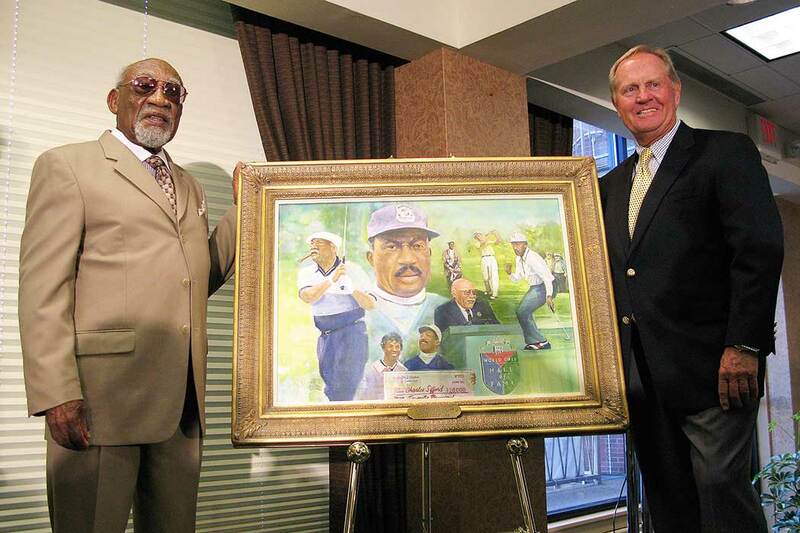 Charles Sifford at the 2008 Ambassador of Golf Award ceremony, where he was introduced by Jack Nicklaus. On this very sad day when we mourn but celebrate the life of Charlie Sifford, I can’t help but reflect on what Charlie meant to me and many others. I first met Charlie when I was just 18 years old and playing in my first PGA Tour event. Charlie and I were grouped together the first two rounds and we hit it off from the first tee and remained good friends ever since. When I look back on that first round—me, a wide-eyed kid making my first swings and taking my first steps down the fairway in a Tour event—I can’t think of a better person to have walked side-by-side with than Charlie Sifford. He was kind, gracious and a true gentleman. Charlie helped pave the way for my Tour career, but in the much larger picture, he helped pave the way for so many in the game of golf. Charlie led by example, handling himself with great class and dignity inside and outside the ropes. Because of steadfast pioneers like Charlie, the PGA Tour I joined in 1962 was a Tour that welcomed all. We can’t underestimate the impact Charlie’s career has had on the face of golf today. Charlie was a leader and an inspiration. Most of all, to me, he was my friend. My wife, Barbara, and I will miss Charlie, as will the game of golf.